This is lovely - I like that big daisy. Thank you for joining us at Tuesday Morning Sketches. Beautiful card! I love your flower!! What a wonderful envelope you've made - it's more like a gift! 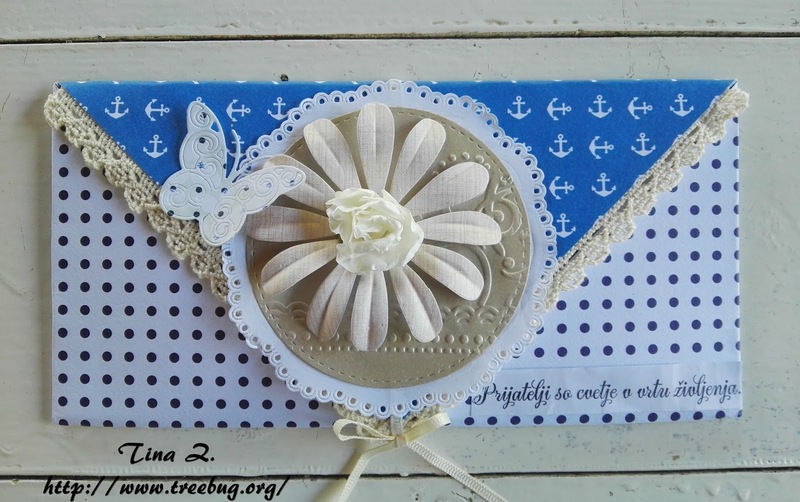 The lacy edge around the flower looks so pretty with the butterfly accent, and I love all those tiny anchors! Thanks for joining us at the Tuesday Morning Sketch challenge, and we hope to see you back again! This is a fabulous gift envelope Tina, so pretty. 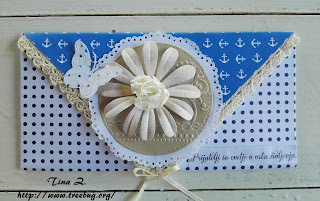 What a beautiful gift envelope! Lovely with the touch of summer. I'm sure the recipient is going to love it. Another pretty envelope. I do like that paper with the little anchors. Love the daisy too. Thank you for fluttering into the butterfly garden. Hugs Mrs A.
Lovely - very pretty with the touch of lace too. So pretty - love the dimension and texture added by your big flower! Thanks so much for joining us at SugarPea's Mix it Up Challenge! Wow, so pretty! I love the big flower in the center! Thanks for joining us at SugarPea Designs!